8:13 a.m. — Police received a report of four semis stuck on Carter Drive and unable to go anywhere. 1:26 p.m. — A resident in the 600 block of Cherry Street reported a car broken into. He said the inside of the vehicle was trashed and a wallet was stolen. 1:45 p.m. — A boy faces charges of criminal trespassing and criminal damaging after a resident in the 500 block of Richardson Avenue called to complain about a kid banging on a door and throwing rocks at a car. 3:40 p.m. — Police responded to semi trucks disrupting traffic in the area of Drug Mart. 5:14 p.m. — An ATT refund car with $284 available on it, was used by someone other than the owner, who lived in the 1200 block of East Walnut St.
5:17 p.m — Police received a report from the 300 block of Fairview Avenue about someone making threats on Facebook. 6:12 p.m. — The sheriff’s department investigated a report of a vehicle hitting a pole in the area of Monnett New Winchester Road and Ohio 309. 6:23 p.m. — A resident in the 100 block of Pounder Avenue reported littering in the yard. 6:29 p.m. — A resident in the 400 block of Libby Lane reported being beat up. The alleged “beater” was gone when police arrived and information was taken for a report. 7:17 p.m. — Police responded to a report of a drunk relative who would not leave when asked to do so. The “drunk” left by the time police arrived at the residence in the 300 block of South Market Street. 9:44 p.m. — Police received a report from the 500 block of Harding Way East about someone being in possession of stolen merchandise. The caller was advised to take some photos of the stolen merchandise and to find out where it is being taken to. 12:46 a.m. — Police investigated a report of two guys yelling at each other in the 600 block of South Market Street. 1:48 a.m. — A person in the 200 block Fellow Street asked police to check on a relative who was not acting right. 3:00 a.m. — Police spoke with residents in the 400 block of John Street about a loud disagreement between two women. Police determined physical assault had occurred. 7:54 a.m. — Police checked on a report of a man acting “weird” in the 700 block of Cherry Street. Officers couldn’t find the “weird” man. 8:06 a.m. — A resident in the 200 block of Grove Avenue reported that his vinyl fence, that had been up to keep his dog in the yard, had been damaged when someone rammed a board through it. And now the dog was able to get out. 12:13 a.m. — A resident in the 100 block of South Boston Street reported finding some hot dogs in the yard and wanted to make a report because of the poisoned animals in the last few weeks. 12:19 p.m. — A worker with the City of Galion found a bracelet found near the substation in Heise Park. It was turned over to police. 12:26 a.m. — A responding to a reported assault in the 400 block of Fifth Avenue, one woman was given a summons charger her with falsification. 4:08 p.m. — Police warned a man about playing music too loud after hearing a complaint in the 700 block of South Boston Street. 5:02 p.m. — Police responded to a complaint from a resident in the 700 block of South Boston Street about a neighbor. 5:45 p.m. — Police responded to a complaint about neighbors in the 500 block of Libby Lane. 7:40 p.m. — Two men were cited for having open containers after reportedly walking away from Moto Mart on Harding Way West with open containers of alcohol. 7:43 p.m. — Police responded to a report of a fight between a bunch of kids in the 100 block of South Pierce Street. Neighbors said the kids fight all the time. 8:59 p.m. — Police issued a warning to man after a neighbor complained about smoke bombs in the area of Boyd Boulevard and Clymer Avenue. 9:43 p.m. — Partiers in the 700 block of Cherry Street were warned about setting off fireworks after a neighbor complained. 10:08 p.m. — Police responded to the 500 block of Harding Way East after receiving a report of fireworks being shot off. 11:03 p.m. — Police investigated a report of fireworks being set off in the 700 block of Charles Street. 6:23 a.m. — Police responded to a report of a domestic dispute in the 100 block of Harding Way East. 9:54 a.m. A resident in the 700 block of Henry Street reported that a neighbor had called police the previous night because he was reportedly beating up a woman on the roof. He just wanted to report that the man who made the first has hallucinations. 9:55 a.m. — Police responded to Heise Park lane after a report of a woman stalking a man. The caller was advised how to get a protection order. 11:12 a.m. — Police responded to Galion Building and Loan to get information about money being taken from a checking account without permission. 2:14 p.m. — Police responded to a report that construction equipment parked on Hesby Drive and Heise Park Lane had been vandalized. 3:41 p.m. — A person cleaning out stuff that belonged to an old roommate in the 1100 block of Dawsett Avenue reported finding “needles and other drug stuff.” The “stuff” was collected for disposal. 4:00 p.m. — An employee at Ralphies reported that a man who was drunk left the premises in a vehicle after telling workers that he was not driving a car. 4:34 p.m. — An employee at Longstreth Memorials reported a rabid animal on one of their trucks. Police were unable to catch the animal with the equipment they had in hand and advised the employees to call back again if the animal moves to a different area. 5:52 p.m. — Police responded to a fight between girls in the 600 block of Grove Avenue. A report was not taken. 7:16 p.m. — A resident in the 500 block of Galion Arms Court reported that someone had disconnected the brakes on his son’s bike and the boy almost got hit by a car. 1:00 a.m. — A resident in the 900 block of Allen Street reported his neighbors were drunk and singing loudly, and that they were terrible singers. 1:19 a.m. — Police talked to three teenagers who said they found a backpack at the Pickle Run Festival. 2:11 a.m. — A resident in the 100 block of East Street reported that someone was on the way to hurt her, and was probably drunk and probably had alcohol on him. Police stopped the man and told him to turn around and go back where he came from. 9:44 a.m. — A resident in the 400 block of Libby Lane reported that her “ex” was there and was trying to break the windshield in her car. 10:19 a.m. — A resident in the 600 block of Crew Avenue reported seeing a neighbor beating a dog. 2:03 p.m. — The driver a vehicle reported the vehicle had been hit by an egg in the 400 block of Fifth Avenue. 3:39 p.m. — Police investigated a possible in the 100 block of West Walnut Street. No chargers were filed. 3:46 p.m. — Police responded to some open man-hold covers near Heise Park Lane and Ohio 598. The covers were replaced. 3:47 p.m. — Police responded to a domestic disturbance in the 200 Gill Avenue. One of the parties left for the day. 4:20 p.m. — After reporting to a report of a man threatening to kill himself, the man was released to personnel at Galion Community Hospital. 4:56 p.m. — Three girls were stopped and talked to by police after reportedly walking through a yard in the 800 block of Elm Street and doing some damage. 7:20 p.m. — Police responded to a residence in the 700 block of Charles Street. The caller said there was a man asleep in a chair in the back yard and could not be awakened. Police determined the man was just sleeping. 7:49 p.m. — A resident in the 100 block of Gill Avenue reported neighbors were shooting off fireworks. 9:38 p.m. — A wallet was found at Heise Park and turned over to police officers. 9:59 p.m. — Police received a report of something that sounded like gun shots in the 200 block of Westgate Road. 10:18 p.m. — Police received a report of vehicles parked in the area of Erie Street and Heise Park during the fireworks. 10:27 p.m. — Police responded to a report of small kids riding their bikes in the road near Fortney Avenue and North Market Street. Police talked to the bike-riders and told them to stay off the road. 11:34 p.m. — A resident in the1400 block of Baehr Street reported a large bomb had just been thrown in their yard. 9:51 a.m. — A patient with reportedly self-inflicted knife wounds received treatment at Galion Community Hospital. The woman was advised to get counseling after receiving treatment. 11:56 a.m. — Police received a report of a broken limb on a tree near Atwood and South Columbus street that needed to be removed. 1:22 p.m. — A resident in the 400 block of Wine Street reported a plant stolen from a porch. 3:34 p.m. — Police encouraged a resident on Pierce Street to go to the hospital after threatening suicide. 6:30 p.m. — A complaint of fireworks being set off in the area of West Church and North Market streets was received. 9:49 p.m. — Police talked to some folks in the 600 block of South Union Street about fireworks being set off. 10:16 p.m. — Police investigated a report of fireworks in the 100 block of Gill Avenue. 12:56 a.m. — An assault was reported in the 500 block of Galion Arms Court. lyembers who were fighting were separated for the night. 9:02 a.m. — A purse left at Duke and Duchess was turned over to the police department. 12:22 p.m. — A man reported that people are taking advantage of a friend, who keeps giving her possessions away. The friend was told to contact Adult Protective Services to ask for help. 4:54 p.m. — A report of a possible overdose victim was received from the 800 block of Harding Way East. The “victim” was taken to the hospital for treatment. 8:34 p.m. — Police responded to a domestic dispute in the 400 block of Libby Lane. One of the people involved left for the night. 9:33 p.m. — Two people were given warnings for disorderly conduct after a reported fight in the 200 block of Libby Lane. 11:52 a.m. — Police investigated a report of fireworks being set off in the 100 block of South Jefferson Street. 9:29 a.m. — A woman, reportedly confused, was being cared for by residents in the area of Atwood Street and South Street. Police contacted a person to take her home. 9:54 a.m. — A resident in the 600 block of North Market Street reported a bag of break and dog biscuits left in the family’s dog kennel. They turned them over to police. 1:42 p.m. — A worker at Sluss Realty reported received a threatening email. 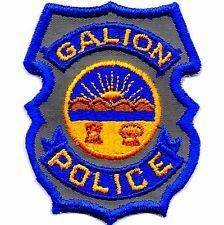 2:50 p.m. — A resident in the 500 block of Galion Arms reported his residence being egged. 4:17 p.m. — Police investigated a possible drug transaction in the 500 block of Sherman Street. 4:53 p.m. — Police received a report of a stolen license plate from a vehicle at Covert Manufacturing. 5:24 p.m. — Police investigated a report of a bunch of stolen bikes being found at the YMCA on Gill Avenue. 5:26 p.m. — Police received a report of a man being threatened in the 300 block of Kroft Street. 7:37 p.m. — A resident in the 12oo block Nazor Road reported being threatened by a former acquaintance. 10:50 p.m. — Two stolen bikes were reportedly recovered at Buckeye Arms Apartments on North Market Street. 7:25 a.m. — Officers investigated a report of a vehicle break in in the 500 block of W. Charles St.
9:03 a.m. — Officers picked up the contents of a purse that was reported stolen in the 100 block of N. Lane St.
12:19 p.m. — Officers investigated a report of a two car minor collision in the Kroger lot. 2:07 p.m. — Officers stood by in the 400 block of W. Warren on a civil matter. 4:27 p.m. — A written warning for junk vehicles was issued in the 400 block of W. Mansfield Street. 5:56 p.m. — Officers stood by for a civil custody exchange in the 400 block of W. Warren Street. 6:50 p.m. — A resident in the 500 block of Failor Street reported items missing from his residence. 7:07 p.m. — A resident in the 500 block of S. Walnut Street reported money stolen from his residence. 7:52 p.m. — A report of a possible trespassing situation at Larno Apartments was investigated. 7:53 p.m. — A report of vehicles tearing up the grass at Harmon Park was investigated. 9:17 p.m. — A disturbance in the 200 block of W. Mansfield Street was investigated. 9:39 p.m. — A report of gunshots in the area around Jump and Sears Streets turned out to be fireworks in the area. 10:04 p.m. — Officers checked on a couple suspicious vehicles parked at the end of Crossroads Blvd. 11:35 p.m. — A report of people shining laser pointers in windows in the 400 block of Dudley St. was investigated. 12:09 a.m. — A report of loud music in the 500 block of Failor St. was investigated. 1:37 a.m. — A report of juveniles walking around Walmart without and adult was investigated. 2:52 a.m. — A report of a possibly intoxicated driver in the 100 block of W. Mansfield St. was investigated. 7:43 a.m. — A purse that was stolen from a vehicle in the 1100 block of Rosedale was turned into the Police Department. 9:10 a.m. — Officers investigated a one car injury accident on Highland and Warren Streets. The vehicle rolled over, driver and passenger left the scene on foot and were later located. Both were checked by Life Support Team. The driver was given two citations and released. The vehicle was towed from the scene. 9:31 a.m. — Officers investigated a break in to a shed in the 200 block of Woodlawn Ave.
11:23 a.m. — A resident in the 1100 block of Victoria Dr. reported a vehicle trespass and a purse stolen. 11:41 a.m. — Officers investigated a report of a disturbance in the 500 block of Failor St.
12:58 p.m. — Officers investigated a report of a disturbance in the 500 block of S. Sandusky Ave.
1:10 p.m. — Officers investigated a neighborhood dispute in the 300 block of E. Oakwood St.
1:37 p.m. — Officers assisted hospital employees with a disorderly patient. 2:06 p.m. — A report of illegal dumping of trash was investigated in the 1800 block of E. Mansfield St.
2:19 p.m. — A report of loud music in the 1100 block of Hopley Av. was unfounded. 3:16 p.m. — An abandoned bicycle found on N. Lane St. was turned in at the Police Department. 3:43 p.m. — A 19-year-old man was arrested in the 1800 block of Marion Rd on charges of OVI, underage consumption, trespass and stop sign violation. 6:50 p.m. — From a traffic stop, a 33-year-old man was arrested in the area of Irving and Willard for possession of drug paraphernalia. 7:02 p.m. — Officers checked the area of East and Woodlawn for a bicycle reported to match the description of a bicycle reported stolen several days ago. 9:30 p.m. — Two expired license plates were turned over to officers in the 100 block of E. Mansfield St.
9:59 p.m. — Officers investigated a fireworks complaint in the 300 block of Iron St.
10:01 p.m. — Officers investigated a fireworks complaint in the 1500 block of Fairview Av. 10:19 p.m. — A verbal warning was issued for shooting off bottle rockets in town. 12:32 a.m. — A verbal warning for loud music was issued in the 1100 block of Hopley Avenue. 12:55 a.m. — A verbal warning for loud music was issued in the area of N. Walnut and Perry Street. 6:24 a.m. — A subject in the 600 block of S. Walnut Street reported being assaulted by someone she knows. 10:07 a.m. — Officers investigated a report of an unruly teenager in the 300 block of W. Center St.
10:57 a.m. — Officers checked the welfare of a man in the 400 block of N. Walnut St.
1:07 p.m. — A report of a disturbance in the 400 block of S. Sandusky was investigated. 1:19 p.m. — A report of a dog left in a hot vehicle was investigated in the 200 block of E. Galen St.
3:44 p.m. — A landlord tenant dispute was reported in the 200 block of Blicke St.
5:23 p.m. — Officers resolved a disturbance in the 1900 block of Whetstone St.
5:25 p.m. — A juvenile complaint was investigated at Aumiller Park pool. 6:18 p.m. — A disturbance was investigated in the 1700 block of Whetstone St.
7:01 p.m. — A report of an attempted breaking and entering was taken in the 300 block of E. Mansfield St.
9:17 p.m. — A disturbance was investigated in the 900 block of Earl St.
9:35 p.m. — A vandalism report was taken in the 900 block of S. East St.
10:02 p.m. — A noise disturbance was reported in the 400 block of Euclid Av. 10:07 p.m. — A juvenile complaint was investigated in the 100 block of River St.
11:18 p.m. — A domestic disturbance in the 700 block of Sunset Drive was mediated. 11:47 p.m. — A warning for fireworks was issued in the 400 block of W. Warren Street. 12:13 a.m. — Two juveniles were warned for being out past curfew and given a ride home. 6:04 a.m. — A domestic disturbance in the 900 block of Marion Road was a verbal dispute. 7:37 a.m. — Officers assisted Life Support in the 1500 block of Edgewood Drive. 1:37 p.m. — Officers responded to a fight between two females in the 500 block of Whetstone St.
1:59 p.m. — A Heritage Circle resident was warned against letting off bottle rockets, and a juvenile was warned against riding a minibike in the street at the same location. 2:54 p.m. — A report of a suspicious vehicle was investigated in the 400 block of S. Sandusky Av. 3:06 p.m. — A report of fireworks in the area of Emerson and Maple St. was investigated. 4:40 p.m. — A civil stand by was completed in the 400 block of Jump St.
5:11 p.m. — A disturbance was investigated in the 1700 block of Whetstone St.
5:18 p.m. — A report of a dog left in a hot vehicle was reported in the 200 block of N. Sandusky Av. 5:25 p.m. — A welfare check was completed on Whetstone St.
5:50 p.m. — A welfare check was completed in the 400 block of W. Mansfield St.
5:52 p.m. — A two-vehicle accident was investigated in the area of Sandusky and Rensselaer St.
6:04 p.m. — A disturbance was investigated in the 400 block of N. Sandusky Av. 6:24 p.m. — An animal complaint was investigated in the 100 block of W. Mansfield St.
9:07 p.m. — A suspicious vehicle was reported in the 200 block of E. Mary St.
9:15 p.m. — A report of fireworks was reported on Sherman St.
10:27 p.m. — Officers responded to an accident in the Whetstone St. area. 10:33 p.m. — A report of fireworks in the 500 block of S. East St. was investigated. 10:39 p.m. — A report of fireworks in the 800 block of Faustina Ave. was investigated. 10:46 p.m. — A motorist reported a beer can thrown at his vehicle in the area of Whetstone St. and Wheeler Ave.
10:51 p.m. — A report of fireworks in the area of E. Warren St. and Jones St. was investigated. 11:28 p.m. — A resident in the 1200 block of Home Circle Drive reported someone knocking on her door and windows. 2:36 a.m. — A report of an assault in the 400 block of Woodlawn Ave. was investigated. 2:49 a.m. — A resident in the 200 block of E. Irving reported his home broken into and property stolen. 2:59 a.m. — A report of a dog bite in the 100 block of W. Mary St. was investigated. 7:20 a.m. — A report of an engine revving in the 800 block of W Mansfield St was unfounded. 7:50 a.m. — A Hull Ave resident reported her unlocked vehicle entered overnight. 8:40 a.m. — Officers dispatched an injured raccoon in the 100 block of Sears St.
8:51 a.m. — A report of a suspicious vehicle at Outhwaite Reservoir was investigated. 1:20 p.m. — A purse found in the 900 block of Woodlawn Ave. was brought to the police station. 5:23 p.m. — Officers checked the 900 block of Marion Rd for an intoxicated person. 5:31 p.m. — Officers assisted a disabled motorist in the area of N. Sandusky and Crossroad Blvd. 5:40 p.m. — Officers checked the 300 block of S. Sandusky for an intoxicated person. 6:48 p.m. — A report of a dog in a hot vehicle was reported. The dog was fine. 7:47 p.m. — A report of an erratic driver was made in the area of Poplar and Oakwood. 9:48 p.m. — A report of fireworks in the 1100 block of Teddy Ave. was investigated. 10:56 p.m. — A report of fireworks in the 500 block of Gay St. was investigated. 11:36 p.m. — A report of fireworks in the 400 block of E. Lucas St. was investigated. 11:42 p.m. — A report of fireworks in the 200 block of E. Mary St. was investigated. 12:57 a.m. — Officers investigated a domestic issue in the 600 block of Prospect St.
1:22 a.m. — A resident in the 800 block of Beverly Dr. reported someone scratching at her windows. 6:31 a.m. — A report of a dog on a roof in the 200 block of Plymouth St. was investigated.